Apple Tree Backpackers i Tauranga, New Zealand: Reservér nu! 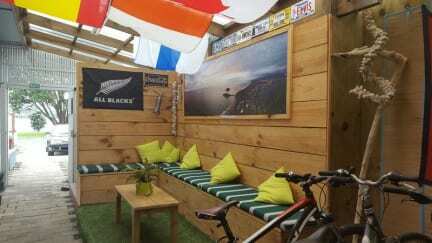 Nested right between the beaches of Tauranga and Mt Manganui you will find our cosy newly renovated backpackers . We have clean and comfortable accommodation,tenting site, free parking and free unlimited WiFi! Relax on our laid back terrace with waterfront or garden view. Enjoy our Movie nights on Every Wednesday and Friday in a big screen. Lets be honest this is a great way to meet other travelers and just relax from all that traveling. Next to all this you can also rent one of our kayaks, mountain bikes and/or fishing rods or take one of the many walks and enjoy a day in the sun. Around the backpackers there are heaps of shops in walking distance like cafes, restaurants, supermarkets, and other shops. And don't be shy to see us as we are happy to share our knowledge of everything that is going on in town and help you plan your adventures here in the Bay of Plenty.